Received SNR (S+N/N) measured at data detector. The LINK programming environment consists of a FORTH dictionary with two vocabularies, the LINK vocabulary and the LFORTH vocabulary. When a packet enters the LINK machine interpretation is commenced with the context pointer pointing at the LINK vocabulary. The LINK vocabulary can be said to represent the programming environment for non-privileged users. In this vocabulary only a few words are available. These are listed below. Among them are the so-called format words, which define the access algorithm and the format of the packets used. The standard system has at least to contain the two standard format words IF' and "A" described below. 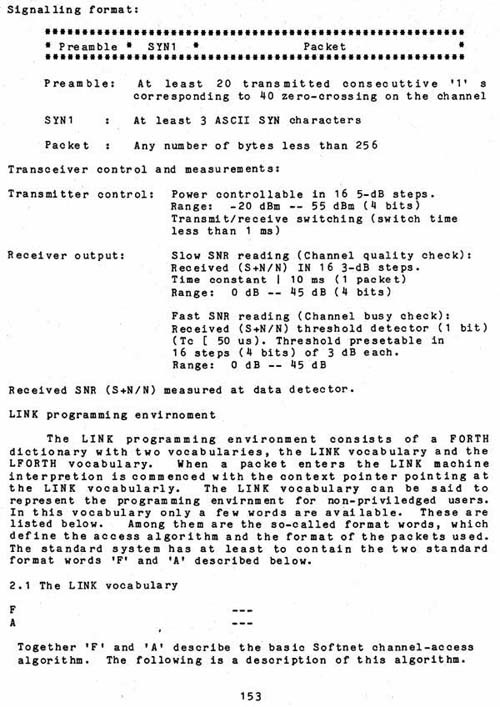 Together 'F' and 'A' describe the basic Softnet channel-access algorithm. The following is a description of this algorithm.